For weekend and holiday updates call 780-467-5800. Please note: If conditions change after the update has been made, please use your own discretion in order to prevent player injury and turf damage. Please notify Facility Bookings the next working day if you have cancelled your game and need to reschedule. For a list of all scheduled closures for maintenance, scroll to the bottom of the page. Sign up for the field and diamond status e-newsletter here. The web page will be updated and the eNewsletter will be sent out only WHEN A CHANGE OCCURS that either opens or closes the fields. Fields may be closed due to unsafe playing surfaces and to prevent severe turf damage. Even if a field is deemed as open, the condition of the field may change after the field status has been updated. During heavy or prolonged rain, please discontinue play to reduce damage to playing surfaces and player injury. Looking for a field or diamond on the go? Download the Parks app today! Beginning in April 2019 Strathcona County will be placing two to three decoy dogs around the fields at Broadmoor Lake Park. 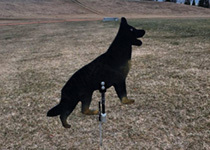 The decoy dogs are not real but are made to look like a real dog or coyote in order to deter the geese from going on the fields.